Colour matching is one of the things I just have to get right when working on a card, but that can be difficult if I’m combining word art created on a PC with, say, Promarkers or ink pads. 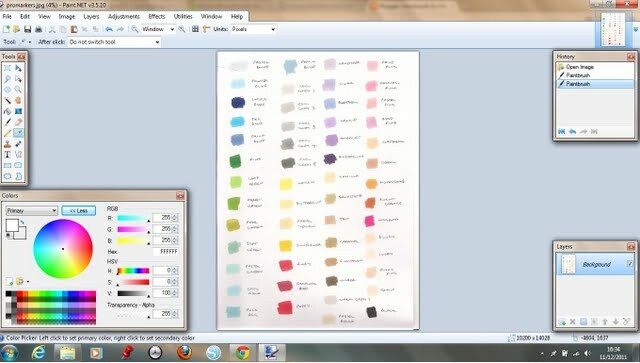 You can use Microsoft Paint but I use Paint.NET because it’s quicker when matching multiple colours. First scan the picture you want to colour match and save it as a jpg or bmp file. In the screenshot below I’d coloured a small square of each Promarker I have onto the A4 card I normally use. I find Letraset’s colour chart isn’t an exact match and the colour varies depending on the card used which is why I’ve made my own colour chart. Open the saved file in Paint.NET, then click on the Color Picker which looks like an ink dropper (or type a capital K which is the shortcut code for it). Next click on Windows –> Colors (or press the shortcut key F8) and a small window will appear in the bottom left corner of your screen. Click on More to get the RGB codes to appear. Your window should look similar to mine below. Simply click on the area you want to colour match. In the Color window the RGB codes will change & the small square in the top left corner of the colour window should change to match the colour you’ve selected. I found that clicking in different areas of the same square gave a different result so I tended to pick the densest area of colour. Make a note of the RGB codes & use this in whichever program you use to create your word art (I use the free version of Serif Page Plus). I hope someone can find the above useful!